Mary McCarthy is an author, reiki master, journalist and beachcomber on the Chesapeake Bay. She currently works as Senior Editor at Splice Today and her 25-year professional writing career includes Salon.com, the Washington Post, Philadelphia Inquirer, Baltimore Sun, Glassing/Beachcombing magazine, editorial positions at several regional magazines including Chesapeake Family and What’s Up Eastern Shore and a newspaper humor column “Quite Contrary”. She blogged for Katie Couric, appeared on The Today Show, Huffington Post Live and ABC TV News’ Moms Get Real with JuJu Chang. She has served as an Adjunct Instructor for American University’s LEAP program, guest lecturer for the Philip Merrill College of Journalism at the University of Maryland and an instructor for The Writer’s Center in Washington, D.C. McCarthy, who served as an elected official on the Centreville Town Council from 2004-2007, founded the blog Pajamasandcoffee.com in 2008. 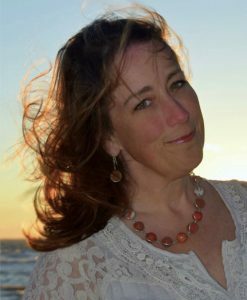 She serves on the Board of Directors of the North American Sea Glass Association where she is also Education Chair, and is Executive Director of The Sea Glass Center educational nonprofit organization. She has lectured, done educational exhibits/sea glass identification and/or judged at many sea glass and beachcombing conferences around the country including the International Beachcombing Conference, North American Sea Glass Festival, Santa Barbara Sea Glass & Ocean Arts Festival, Northeast Sea Glass Expo, Great Lakes Beach Glass & Coastal Arts Festival, Santa Cruz Sea Glass and Ocean Arts Festival and Long Beach Island Sea Glass Festival. She founded SeaCrate, an ocean-themed monthly subscription box service. McCarthy’s debut novel The Scarlet Letter Society was published by Polis Books in June 2014, reaching #1 on the Amazon bestseller list in its genre. Her second novel The Scarlet Letter Scandal released in November 2015 and her third novel in the trilogy The Scarlet Letter Storm in May 2016. Mary is a mother of four on Maryland’s Eastern Shore where she enjoys kayaking and beachcombing. She is currently working on several nonfiction book projects. Find her on Twitter, Facebook, Pinterest and Instagram.